A well-rested baby is not only a happy baby, but a healthy baby, too. In order to make sure your baby gets enough sleep, it’s important to develop a regular sleep schedule that you stick to. It’s important to be able to recognize the signs that your baby is sleepy; if your baby gets overtired, they’ll be cranky and havsoe trouble falling asleep. Here are the signs to look for: keep these in mind, and you’ll be much better prepared in recognizing when your baby is ready for a nap. Your baby’s actions will probably show the first signs that they’re ready for sleep. Some, but not all, babies will yawn: an obvious sign that they’re sleepy. Other physical signs that your baby might be ready for a nap are rubbing their eyes, or sucking their fists. The latter might not always be a sign that your baby is tired, as some children do this even when they’re not sleepy, however. If they thrash their limbs about—especially their arms—this can be a sign of tiredness, too. Babies cry a lot: it’s the only way they know how to communicate that they’re unhappy. Crying can indicate that your baby is overtired and cranky, so they may have passed the point where it becomes difficult for them to fall asleep. If your baby is crying or fussy and they’re not hungry and have all of their other needs met, this can be a good indicator that they’re probably ready to sleep. When a baby is getting tired, their alertness tends to noticeably drop off. Since babies can’t communicate directly to you that they’re tired, watching for subtle clues that their level of alertness is dropping is a good way to tell early when your baby is tired, before they’re awake for too long and become overtired. Watch for signs that their level of attention is decreasing. If they aren’t paying as much attention to you, to their toys, or to the environment around them. 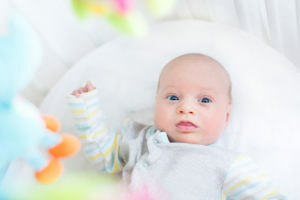 If your baby tends to act happy and playful when they’re playing with their toys or with you, but this suddenly stops, it’s probable that they’re starting to get sleepy. If your baby is starting on a sleep schedule every day, they will probably start to get sleepy around the same time of day, every day, as long as they got enough sleep earlier. Young babies also tend to get sleepy after certain activities: for example, they might get tired after every time they are breastfed. It’s important to note that not all children will give obvious signs that they’re sleepy. They might not get cranky or upset when they’re tired, or otherwise show any obvious physical signs of being sleepy. There will probably be subtle clues, such as a drop in alertness or a general slight look of tiredness. If you’re the parent of one of these children, you’ll have to learn to pick up on the subtle clues that your baby is tired. It will probably also help to get them to sleep on a regular basis every day, regardless of whether they look tired or not. Once you’ve gotten accustomed to recognizing the signs that your child is tired, you can begin to start them on a daily sleep schedule. Doing so will make it much easier to get them to sleep, too, because they’ll usually find it easier to stick to a schedule they’ve been on for a while. Sticking to a schedule is important, because babies will find it difficult to get to sleep if they’re being put to bed at different times of the day every day. If at all possible, try to avoid any activities that will interrupt your baby’s sleep schedule on any given day. If your baby has a regular babysitter or is in daycare and has to sleep on a schedule of their choosing, your best bet is to continue that same schedule when they’re at home, too. Consistency is the key!